Colombian artist currently living in Houston, TX area. Maria Claudia has always had a profound love and sensibility for nature. She holds an Agronomy Engineering degree from the Tolima Unversity ( Colombia). 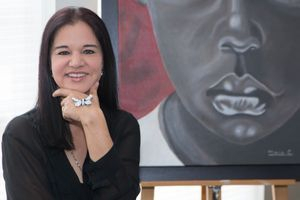 The need to express her feelings about everything around her finally got an outlet through painting in 2004, when she started formal training in Villahermosa, Mexico, under the tutelage of renowned artist Roman Barrales. After this invaluable experience, Maria Claudia has explored different techniques. Some of her more notable creations use oil painting on canvas, combined with textures and precious metals.